Newbold said the 25 were granted access to national security information since 2018 despite allegations of foreign influence, conflicts of interests, questionable or criminal conduct, financial problems, or drug abuse. In her testimony, Newbold said she and another career employee denied Kushner security clearance last year because he had too many “significant disqualifying factors.” They were overruled by Kline. McConnell proceeded with Barr first, but Desmond was confirmed on February 27. In private practice, Desmond worked alongside William Nelson and Sheri Dillon, tax counsels to the Trump Organization. On Thursday, when asked about the NYT report, press secretary Sanders told “Fox & Friends” that the Democrats are a “sad excuse for a political party” and “nothing but sore losers” who are getting “beat” by Trump. Ahead of Trump’s visit, protestors flew a “baby blimp” Trump, the 20-foot-tall inflatable balloon of Trump wearing a diaper and holding a cell phone, which has appeared across the U.S. and other places around the world. 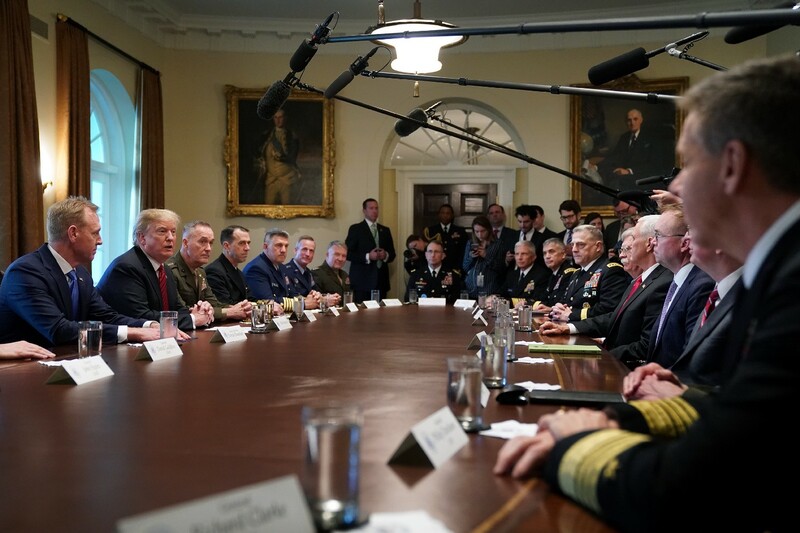 Trump talks to reporters during a briefing with military leaders and others in the Cabinet Room at the White House April 03, 2019. Notably, there was not a single woman or person of color at the table.